I'm gearing up to swap this little 15" square quilt at Mid-Atlantic MOD Quilting Retreat next week! Woohoo!! For the second year, I coordinated all the swaps. In collaboration with Jessica Levitt (@jtlevitt), one of the main organizers, we decided that a rainbow theme would be perfect for a blind swap. Last year's theme was modern anything, so we wanted this year to be a bit more specific. Rainbow seemed to be an accessible theme with a million options for our attendees. Whenever I participate in a blind swap (when you make something that anyone who participates could get), I revel in the challenge to create something that is a piece of "me" (and also something I would love to keep - because if I want to keep it, that means I did a good enough job for my unknown partner!). Ever since my Deconstructed Churn Dash pattern came out, I've been mulling over deconstructed block designs. It only made sense to base this off of a traditional orange peel block, which is one of my signatures (you can see all my orange peel quilts under the hashtag #jsorangepeelcollection). I used the stitch and flip applique method that I teach in my Orange Peels and Improv classes. :) After making so many orange peels over the last two years, I know the process like the back of my hand, and I quite enjoy seeing the little peels come to life! 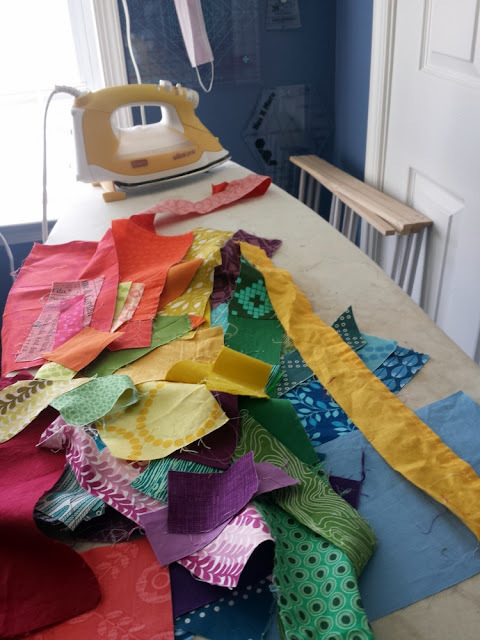 Using only scraps, I created a strippy rainbow. I love a good project that *just* uses scraps. 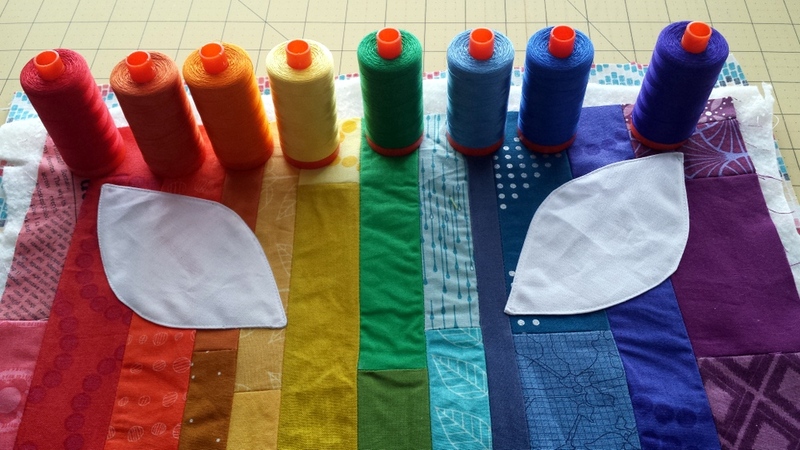 I used several different Aurifil 50 weight threads to create ANOTHER rainbow. I made sure to overlap thread colors to create a truly cohesive rainbow. This is why I love quilting things; it became a whole new piece with randomly-spaced straight line stitching (borderline matchstick quilting). Truly - #quiltthelifeintoit! The back of the quilt is a surprise for my partner. I hope s/he loves it as much as I do (because I really don't want to give it away - have I said that enough yet?!). Thanks to some chatter on Instagram, I decided on a black binding to make the rainbow POP! You can see many of the other rainbow mini quilts displayed on the #midatlanticmod hashtag on Instagram (click the link!). Read more about this quilt and see more in-process pictures here and here. I'm off to prep more for the retreat, finish The Wonky Press (out this Friday), and making more class samples for my Wonky Cross class at the retreat! I'll be back at least once before next Thursday, and I'll be documenting my experience primarily on Instagram (@quiltyhabit). :) As always, though, I'll write a recap post! Here's last year's post, if you are curious. It turned out beautifully, Jess. I definitely agree that if you want to keep it, then it's a winning item for a swap. 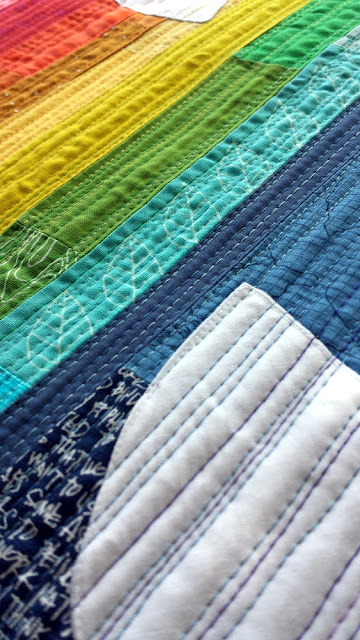 I like that you quilted over the orange peels, that you used a rainbow of aurifil (too! ), and that you overlapped the quilting colors. The black does set it off nicely and now I'm all curious to see the back! ha! I want to win this next weekend! Seriously, I want this!! You can't go wrong with rainbow anything! Whoever receives this will be over joyed...that I am sure of!! Such a lovely colourful quilt! So pretty! That is such a saturated rainbow! LOVE! Well, now I want to see the back! You really know how to tease. I really like the way you've quilted this one. I like the straight line quilting but it's the overlap that makes it work. Beautiful finish! This is a wonderful quilt for a blind swap! I love the thread detail,overlap and texture!